But excitement is just what Beatty was all about a hundred years ago, when just over the hill in the Bullfrog district tent cities arose with the speed of a flash flood. Gold was found, gold was there, and so were hundreds, even thousands of prospectors and camp followers. Shorty Harris was part of it from the get-go. It was his strike, with his partner Ernest Cross, that touched off the run to the Bullfrogs, and created the town of Rhyolite, Nevada (video). 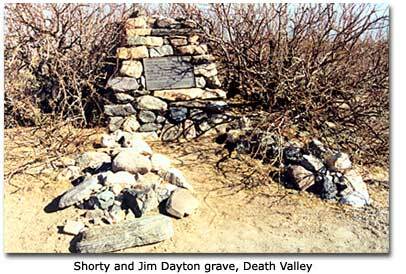 Located over the hill and a few miles west of Beatty, Rhyolite and a few other camps sprung up almost over night and became the sensation of Death Valley when the boys found gold in a green rock in August 1904. Shorty Harris is a name that is heard all over Death Valley. He was a controversial character at times, a little loose with the truth, a single-blanket-jackass-prospector with a taste for whiskey and a habit of spending a little too much time with a bottle of O, be Joyful. He was born as Frank Harris in Rhode Island in 1857, and was an orphan at the tender age of seven. In the 1870s he rode the rails west to make his fortune, and spent time in mining camps from Leadville to Tombstone, and the Idaho country, before coming to Death Valley. He stood all of five feet, four inches tall; he had big ears, sparkling blue eyes and a bushy mustache. Shorty Harris was the exemplary rainbow-chaser. As his nickname implies, he was a man of small stature, who usually had to wear pants and coats that were too big for him. He was a character known throughout the region as a prospector who had found several good claims, but never developed them. He never worked a mine; he was mostly famous for the workings of his jaw. Shorty loved to talk, and he loved the conviviality of saloons much more than the hard labor of mucking ore. The veracity of his stories might be open to question  truth wasn't his strong point, and most of his stories made him out to be quite a hero  but he was well-liked in spite of that. And, he was an exceptionally good prospector. He could find gold like some people can catch colds. Over his lifetime in Death Valley, he'd found many a good claim, but he would sell them to someone else who had the resources and the desire to develop them. Shorty would take his fee, go out on a binge, spend all the money then return to his desert and start all over again. He was popular, the kind of man would give a stranger the shirt off his back. Many old-timers had been fed or tanked up by Shorty when he was in the chips, and they'd return the favor anytime he needed it. He always had a partner, whether it was while prospecting or while he was out on a drinking spree. Bullfrog was his first and best strike. The gold was pure, veins of gorgeous color in a green rock that reminded Shorty of bullfrogs; hence the name. In 1904, the Bullfrog Mountains were just some unnamed dry hills west of Montillus Murray Beatty's ranch, which he had established about a quarter-century before. Shorty was taking part in the excitement at Goldfield some 80 miles north of Beatty's ranch. But no good locations were left at Goldfield  he had arrived at the strike too late to find a claim worth having. So he headed over to the Funeral Mountains where his friend Jack Keane had made a good strike. There, at Keane's Wonder mine, he found himself once again on the outside looking in; there were dozens of prospects but no good locations left unclaimed that had any sign of gold. Shorty remembered some hills to the east in which he had seen some good indications. Cross, who was also coming up empty at the Keane strike, partnered with Shorty and they headed out. "We packed the four burros and struck out, together with some other prospectors who had joined in the Keane Wonder rush. Some of the boys went to Thorp's and some to Tokop, but when we came to Daylight Springs I told Cross I had passed up a country some time before, and as it looked good to me, we would go back to it. We came on to Buck Springs. "Next morning we started west. Cross started down to the little hill to the south, and I went over to the blowout. I found lots of quartz all over the hill and started to break it with my pick. Cross hadn't moved over 400 feet away when I called him back. "The quartz was just full of free gold, and it was the original genuine green Bullfrog rock. Talk about rich! Why, gee whiz, it was great! We took the stuff back to the spring and panned it, and we certainly went straight up. The very first boulder was as rich in gold as anything I had ever seen." That was Shorty's story of the discovery, but Cross's version varied somewhat. About 40 years later Cross told a magazine writer that he'd made the initial discovery, not Harris, with a chunk of gold the size of a hen's egg. But this controversy doesn't matter much other than to fuel the flames of other disputations of the character of Shorty Harris in future dealings, especially with Pete Aguereberry at Harrisburg. The truth will never be known for certain, but it also didn't make any financial difference to the discoverers of the gold. Cross and Harris were full partners in the discovery and shared the original Bullfrog claims. The partners had found one heck of a bonanza, too. When they had the rock assayed in Goldfield, it far exceeded their expectations; they were thinking it would run about $200 to the ton, but it assayed at $665. It was a rich find, and after Shorty and Cross toured the saloons and let out the word, a rush began that, according to Harris, was "...a real stemwinder. It looked as if the whole population of Goldfield was trying to move at once." The town of Bullfrog sprung up on the flats below the hills, a tent city that was destined to die young. 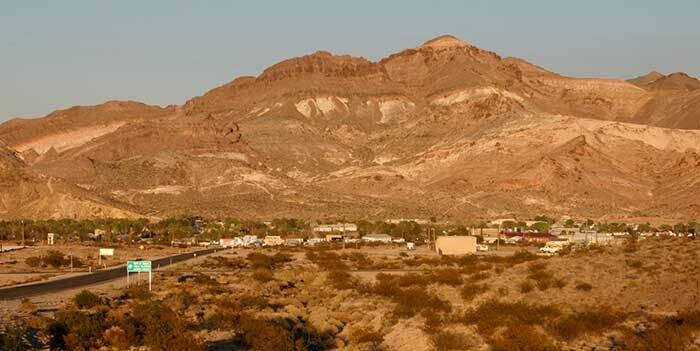 A little over six miles to the south of the original Bullfrog discovery mine the city of Rhyolite came into being, and quickly grew into a metropolis with brick and stone buildings. The skeletons of those buildings stand today in mute testimony of Cross's and Harris's great find, and the tremendous effort made by the people who followed them to develop the Bullfrog strike. 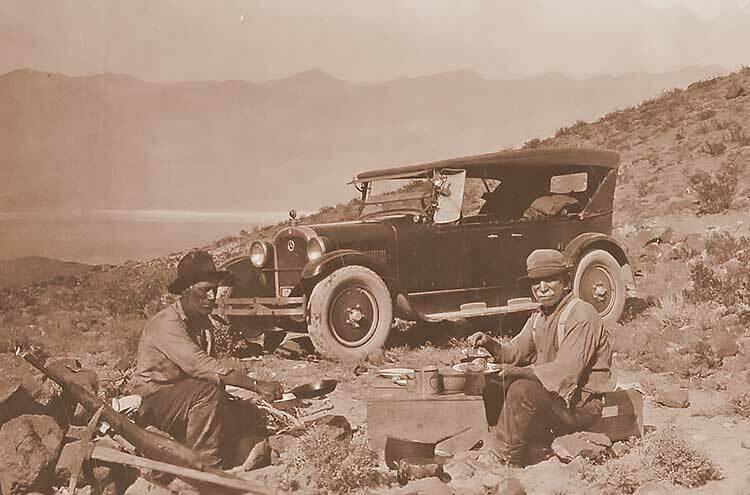 Shorty Harris and companion eating next to an automobile somewhere in Death Valley during the 1920s. At Bullfrog, Shorty Harris was 47 years old and in the prime of his life, keeping up with much younger men. Years later, well into his 70's, he was still tough enough to wander the desert as a single-blanket-jackass-prospector. He wasn't in it for the gold itself; he threw that away every time he found it. It was the life that he loved. He wasn't in it for the possibility of becoming rich. He never had any riches, as society might measure them; he was born poor, lived poor, and died poor. But by all accounts he was a happy man. His gold was in the joy of his life. Rhyolite still stands. This town was not built to die; its founders built to last. They truly believed Rhyolite would be a center of mining for centuries to come. Their dreams were not to be, however. Several solid but empty old buildings stand in mute testimony to their efforts. Two trailer camps have sprung up, where semi-permanent residents live. An art colony is on the southern edge of town. At the colony stand several wood monuments, to the chagrin of the Bureau of Land Management who wants everything here to blend into the desert scenery. These monuments definitely don't blend with anything around here. They are startling caricatures, including a pink lady, a collection of religious icons, and one curious piece: a prospector, swinging a pick, with what appears to be a penguin behind him. 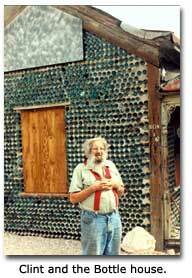 Further up the road is Rhyolite's famous bottle house. Built by Tom Kelly in 1906, it took 50,000 beer bottles to construct it. It's a testament to the thirst of Rhyolite's natives that the two-year-old town could quickly generate that many bottles. The bottle house, as is most of the town, is under the protection of the BLM. A caretaker lives in a travel trailer next to the bottle house, there to answer questions and protect the remaining structures. The caretaker looks the part. Clint Boehringer, a retiree from Oregon, has been staying as Rhyolite's BLM caretaker every winter, from November to April, for the last seven years. His sun-darkened face is offset by a long gray beard, and flowing gray hair. His suspender-slung jeans are worn and faded, as is his cotton shirt. "I've been come here every winter since 1955," he said. "I had a union job, and we had the Christmas season off. There's no better time to be here. We used to come down the old prospectors' trails. Some of them have been closed off by the BLM now as wilderness territory so you can't travel them any more." Boehringer's passionate interest is the history of Death Valley, and particularly Rhyolite. One of the attractions he favors is the bottle house. Until the BLM took it over, it had been in use by several Rhyolite residents. Boehringer, as befitting a local historian, was well familiar with the stories about Shorty Harris. 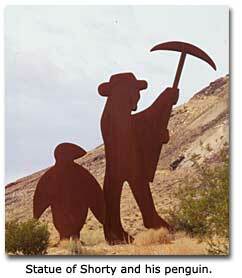 "Did you see the statue of the miner with the penguin behind him?" He asked. "That's a tribute to Shorty. When he'd be out on the desert and would take up drinking from his bottle of O, be Joyful, after a time he'd look behind him and see a penguin following him around. He didn't see pink elephants, he saw penguins." Following Boehringer's directions, we drove past the site of Bullfrog  now just a mud wall or two, fading back into the desert, blending in approved BLM style  and followed a dirt road toward the original Bullfrog. About two and a half miles from Rhyolite we took the fork to the right, and wheeled along a cut in the hillside till we came to the tailings of a mine. Climbing out of the Jeep, we stepped on the desert sand that Shorty Harris walked, and examined the bits of quartz and the few odd floats of green rock that remained after nearly a century of mining and prospecting. With Shorty looking over our shoulder we wandered downstream, prospecting as we went. But our stop in the gullies below the Original Bullfrog didn't make us any money, not even as much as Shorty Harris's prospecting benefited him a century ago. But then, O, be Joyful got the best of Shorty. Not long after his strike he threw a major toot and sold his interest in the discovery claim for $1000. When he woke up from his drunken spree he found himself to be nothing but a single-blanket-jackass-prospector again, and promptly blew the rest of his money on more O, be Joyful. But his partner Cross did very well. He also sold his claim, but for $125,000, and bought a ranch with the proceeds of his Rainbow-Chasing. Shorty loaded up his burros and headed for Ballarat. The town of Ballarat was born to serve the gold miners and prospectors who worked the Panamints during the 1890s. There wasn't much to Ballarat, and its location in the Panamint Valley was less than ideal. Located on the edge of a salt flat, the weather is atrociously hot in summer, as high as 120 degrees, and bitterly cold in winter due to the winds coming off the snow-laden Panamint Mountains. Even so, the town grew to some 500 residents, and boasted the Calloway hotel, a dozen saloons, and two stores, but not a single church. It primarily served the laborers at the gold mines that were being developed nearby and the prospectors that roamed the hills. Ballarat served as a supply point and a party town, and stands in history as the town that supplied many a great story about Shorty Harris. One of the best is the story of his first funeral  the one he lived to tell about. Whether it is true or not, who knows? But it certainly should be told. One Fourth of July Ballarat was celebrating, and Shorty was there. The party had gone on for two days, and Shorty was three sheets to the wind. He was a little under the weather, too, from the two-day hoo raw. He finally passed out. His friends had an idea that would wake him up and sober him down, so he could enjoy the rest of the party. They gathered up some boards and threw together a coffin, then gently laid the snoring Shorty to rest. They placed the coffin on a pool table in Chris Wicht's saloon, and the bartender kept an eye on him while he slept the afternoon away. When Shorty began to stir, the bartender spread the word. Soon votive candles were lit and the rainbow-chasers gathered around the pool table, speaking softly to each other of Shorty's life. Shorty's eyes opened, but he didn't move, while his friends prayed over him and sang his praises. Finally the candles were blown out and the boys picked up the coffin for the trek out to the graveyard. Then Shorty started yelling, and word has it that he jumped out of his coffin and ran out the door of Chris Wicht's saloon, not returning to Ballarat for several months when the shock finally wore off. Shorty Harris hit his big payday more than once. The second time he made the map with a discovery in the Panamints. While out traveling with another prospector, Pete Aguereberry, Shorty not only made his mark with another good claim, he had a town named after him. The year was 1906. Shorty had recently lost his claim at Bullfrog, and while heading back to the Panamints he ran into Pete, who decided to ride along. Crossing the Panamints was a hard and dangerous business, and nobody wanted to do it alone; travelers would team up for safety and comfort. Shorty was on his way to Ballarat for (what else?) the big Fourth of July celebration. Aguereberry was going to Ballarat to collect a grubstake and head out to do more prospecting. On a big flat south of what would become Skidoo, the pair found gold. One or the other of them did; they both claimed to have made the discovery. After a quick trip to Wildrose Canyon for a supply of water, Shorty and Pete staked out claims for themselves and a few friends, then hurried down to Ballarat to spread the news. Pete returned first with a group from Ballarat  history doesn't say where Shorty was, but Wicht's saloon is a good bet. Pete found that some hopeful boys from Wildrose Canyon had already gotten the word. They had jumped his claim, pulling out his location notices and replacing them with their own. Pete, backed up by the party from Ballarat, convinced the claim jumpers they were in the wrong, and won back the claims. A tent city quickly grew, and in days some 300 miners were working the flats. The town was named Harrisberry, named for both of the founders. Somehow it later transformed to Harrisburg - some blame Shorty for that, but most likely it just happened  and Shorty must have had big hopes for his namesake. Yet, true to form, after a while Shorty sold out his interest in the claim and wandered off. It soon became apparent that this was a small strike and the tents were struck, bringing an end to Harrisburg. The town was in its last throes when an even bigger deposit was found over the hill in Skidoo. Later, Pete bought back the original Harrisberry claims and worked the mine for the rest of his life, earning a respectable living. As towns go, even in its heyday Ballarat never was much of a place; and today it's even less. It's located on the southern end of Panamint Valley, north of Trona. Much of the town is privately owned, and even though it is designated as a Historical Site only its few remaining residents  not the BLM or any other government agency  protect the town from the depredations of unthinking visitors. The scenery is out of this world. Right behind the town the Panamint Mountains rise almost straight up off the valley floor, in the space of just a few miles. Across the valley, the mountains that make up the Argus Range seem nearly as tall. The view from Ballarat is stupendous: a long dry lake bed at your feet, desert flats with creosote and the occasional Joshua, the colorful canyon walls of the Panamints and deep blue mountains in the distance, lined with scars and cliffs. It is colorful, wild, rugged and empty. Here Shorty Harris lived out his golden years, in an adobe-mud shanty near Wicht's saloon. From this headquarters he'd head out on prospecting expeditions, nearly always with a partner, and here he kept his old mule. Long after the mule had gone blind he took care of her and let her live out her remaining years happily. Now in Ballarat there's a small general store, a couple of shanties, and a trailer park area. There's an equipment yard, somewhat hidden from view, that mars the view to the east only for a moment. An old truck  reputed to be one of Charlie Manson's  turns out to be a true antique, a 40's-vintage Dodge Power Wagon. At the general store, a verandah provides shade from the westering sun. There's a round table, and patio chairs, and two men sitting, one of them sipping a beer. From their table you can look out over the valley, a peaceful sight that never tires the eyes. There's the main road, which seldom has any cars on it; the Argus Mountains, brooding and mysterious; and the desert, unending desert. The gent with the beer is wearing western boots, the old style that goes up to the knee, and a vest over a plain shirt. He introduces himself as 'Gangrene Gene' Curry, and the three pistols he's packing are authentic and old. They are black powder pieces that appear to date back to the 1880s. "I'm the Marshall here," Curry says, "And Lightfoot Louie here is the mayor and the storekeeper." Louie Shanteler is a young man, perhaps in his early 20's, who grew up in Ridgecrest. He lives here, in the caretaker's trailer across the street, and tends the general store for the owners, who are absentees. They own the junk behind the store as well, an eyesore, we all agree. Curry lives in a trailer in the lot across town  perhaps three hundred yards away  and often, these two are the only people in town. Sometimes Shanteler is alone here, when Curry goes down south to earn his wages. "We get a lot of tourists sometimes, though," Shanteler said, "And you should see it on the weekends. We'll have several people camping here, to go four-wheeling or whatever." The trailer camp fee is by the night, which is a donation to the Ballarat Restoration Fund. "We want to rebuild these places, make it exactly like it was," Curry said. Curry pointed out to me where Chris Wicht's saloon used to be; just the outline remained. Wicht was a popular barkeep and his place was one of the most popular hangouts on the desert. When the town died he closed the bar and stayed in his cabin up the canyon, where, according to Curry, he drank himself to death. "It was the biggest and best saloon in town, heck, in the whole region," he said. "Wicht even had a pool table." Shorty's mud hut wasn't standing any longer, but one just like it was still up, on the main road coming from the dry lake. "People think that was Shorty's cabin, because there is a picture of him standing in front of it, but that isn't it," Curry said. "Shorty's was two doors down." I asked the pair about Shorty's reputation, and whether he was a little loose with the truth. "He was a miner," Shanteler said, with a shrug and half of a grin. Not much remains of the original Ballarat. A couple of mud huts, former miner's homes, and the old assay office are still standing, but the highlight of the trip is the Ballarat graveyard. It's the resting place for more than a dozen souls that met their end in Ballarat. 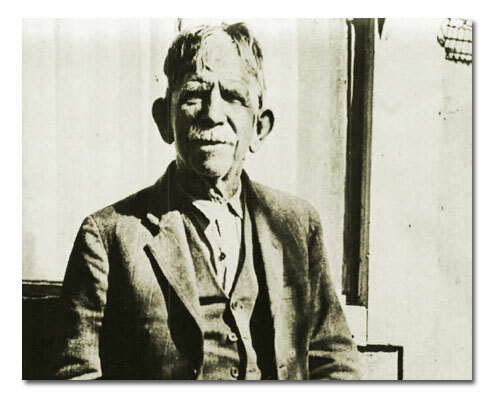 Most famous is 'Seldom Seen' Slim, a prospector that came to Ballarat in 1917, lived out his life here and spent most of his time on the desert hunting minerals  and died here in the 1960's. His funeral made the national television news, as he was the last of the old time Rainbow Chasers. "I got to meet him once," Curry said. "We only talked for five minutes, but I'll never forget it. It was like meeting a legend. He was the last of the old-timers." We have one more stop on our trail of Shorty Harris. The other place we have to go is south of Furnace Creek in Death Valley itself. "Bury me beside Jim Dayton in the valley we loved. Above me write: Here lies Shorty Harris, a single-blanket-jackass prospector."